There are plenty of other topics we didn’t get to last time around, including the wide world of commas. We’ll work our way up to that. Let’s start with some easier ones. A common issue with this is when two people are involved. Lots of people say “My buddy and me played Smash Brothers,” but that’s actually wrong. It should be “My buddy and I.” A good way to check this is to take out the other person and see how the sentence sounds. “Me played Smash Brothers” sounds like Cookie Monster, a known enemy of grammar nitpickers everywhere. That’s how English teachers feel when they hear you talk. “I could care less” is not the sick burn you think it is. This sentence is saying that you are capable of caring less, which is an admission that you actually do care. If you really want to dismiss something, say “I couldn’t care less.” That means you care as little as possible. I find myself using this phrase a lot during football season. “Less” is meant for amounts that aren’t as tangible. “The movie theater is less than 50 miles away.” How much less? He doesn’t know, or else it would be fewer. It’s weird. Again, it’s not commonly used anymore, but it might be useful for a game set in the middle ages. Meanwhile, principle is a fundamental belief or truth that serves as the foundation for anything from scientific theory to moral philosophy. In science, Bernoulli’s Principle refers to fluid dynamics. The idea that you should “love thy neighbor” is a moral principle. If you hear someone they can’t do something “on principal,” they’re doing it wrong. Further is typically used to discuss degree or an extent, i.e. “I wanted to discuss it further, but there wasn’t enough time.” It can also be used as a synonym for “additionally,” as in “Further, you hurt my feelings.” Most people use the word furthermore instead, but further still works. This is not really a grammar problem, but it is a major word usage problem that’s very common. I constantly see people using the word “literally” in exactly the opposite way as it is meant to be used. When you describe something “literally,” that means it happened just like it sounds. “I will literally play over 100 games while judging the IGMC.” This is an accurate statement so it’s an accurate use of the word. This kind of stuff is hyperbole, which is humorous exaggeration used for emphasis. I love hyperbole, it’s fun to say how something feels rather than how it is. But the word “literally” has no place here because it’s role is solely within the realm of what is. Spread the word. This is why you need the Oxford comma. Believe it or not, not everyone agrees on how to use commas. This is especially true when it comes to the “Oxford comma,” which is used for items in a list. Some people don’t like the idea of using it before the “and” at the end of a list. But as the above example illustrates, it’s an important tool to avoid confusion. “My heroes are my parents, Superman, and Wonder Woman” reads much clearer. 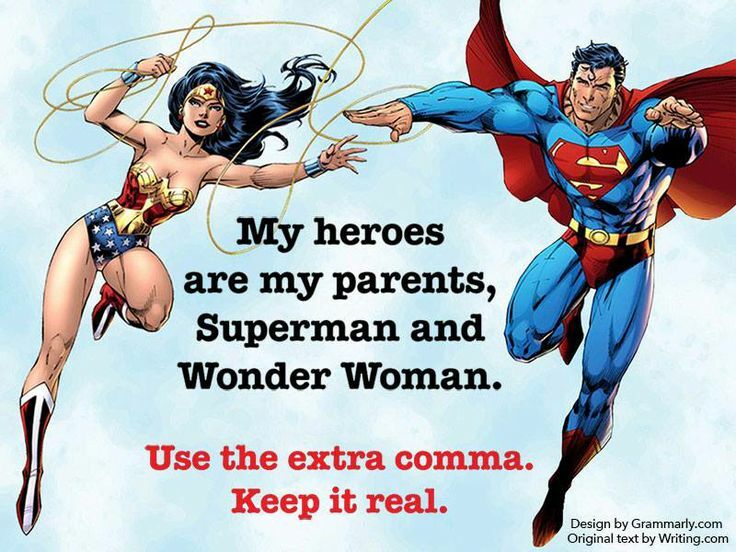 Let’s run though the many other uses of the mighty comma. There are other situations, but these are the most common. Hope this helps everyone out with their commas. There’s more grammar out there to explore, any suggestions for next time? Also, the number thing I mentioned over on twitter. I hardly see anyone use commas in large numbers here in Canada, so it might be good to point out that that is not a set in stone rule? Especially since a lot of organizations consider using a ‘space’ instead to be proper? What’s most important is consistency. Actually, consistency in general might be a good thing to mention. That the comma rules that aren’t 100% set in stone (numbers and oxford comma), what words are capped or not, etc etc should be consistent across the whole game. This is an error I see in a lot of writing as well, not just game dev related stuff. You cap a term here, but then don’t over here. That sort of thing.